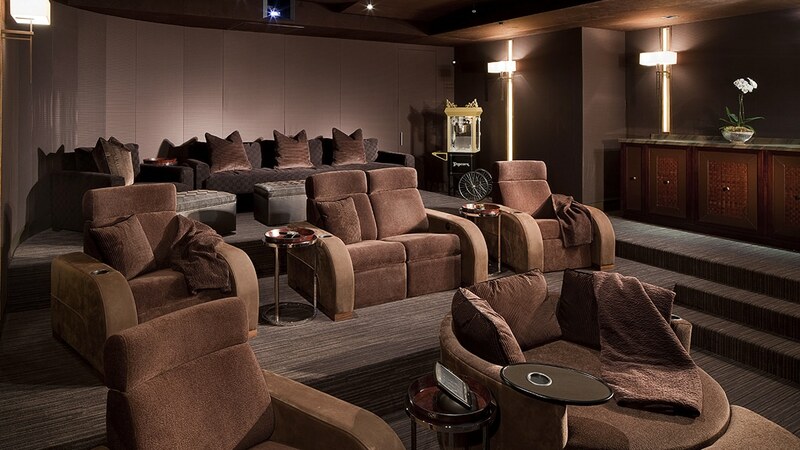 This incredible theater was recognized at the 2012 CEDIA Expo where it was awarded the Electronic Lifestyles Gold Technical Design for Home Theaters Level V.
Stunning zebrawood panels and elegant fabrics draw one’s eye without hinting at the powerful audio system they conceal. That was exactly the goal when the client requested a theater that would complement the main house’s style and craftsmanship but would feature an audio/video system that could outperform commercial theaters and studios. To meet these high standards, a complete Model LS surround sound system was designed for the space. The front wall features stacks of Model LS modules, creating a line source which results in even sound pressure levels for every seat in the theater. Each surround channel consists of two Model LS dipole surround modules stacked on top of each other to give the system even more headroom and power.